It was just a couple months ago that Google Docs improved its spell-check capabilities, making itself that much more attractive to business users seeking an affordable alternative to Microsoft Office. 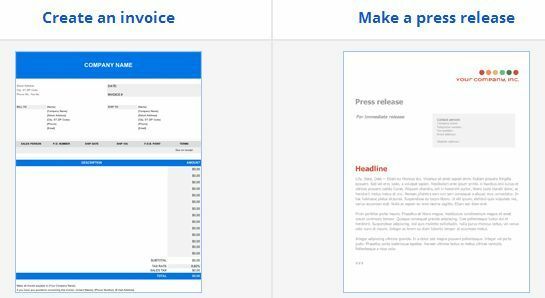 Two more steps forward: Google just updated Docs with 450 new fonts and 60 new templates (many of which cater to business). Until now, Google Docs offered a font selection that could best be described as anemic. Granted, most business correspondence can manage just fine with Arial and Times New Roman, but if you're designing a flyer, invitation, or anything else that invites creativity, you'll definitely want a wider selection. When you click the Font pull-down menu, you'll immediately see a few new additions (and not, thankfully, all 450, which would make for a mighty unwieldy menu). To browse and add new fonts, click the Add fonts option at the bottom of that pull-down. You can filter the selection by one of four main categories: Display, Handwriting, Sans Serif, and Serif. Of course, this being Google, you can also search the font library -- very handy if you're looking for a particular typeface. To check out the templates, head to Google Docs' template gallery, then click See all templates for work. Docs offers a nice variety, everything from cover letters and resumes to invoices and proposals. Still not sold on using Docs instead of Office? Check out PC World's Top 10 Google Docs Annoyances and How to Fix Them, along with How to Manage Google Docs on Your Desktop and 30 Days with Google Docs.